The amazing view from the top of Alligator Light! Kayaking to Alligator Light and surrounding reef. Wrecking was a huge local industry in the 18th century, sometimes also spawning Keys pirates who would try and trick vessels to run aground on one of the reefs to generate more “business”. By the early 19th century, a series of lighthouses began to be built along the edges of the reefs of the the Florida Keys, extending from Key West to Cape Florida on Key Biscayne & beyond up along the Florida coastline. Alligator Reef Lighthouse or just “Alligator Light” is one of the six built, and the closest to land. It is relatively easy to get to being just about 4 miles off shore situated on top of Alligator Reef. The reef and light were named after the USS Alligator which shipwrecked there in November of 1822, although it would be another fifty years until the light was built in 1873! It is a beautiful and sturdy Victorian era tower, standing 136 feet tall, and has survived several major hurricanes and was an operational lighthouse/beacon until the summer of 2014! Alligator Lighthouse in the 21st century. Alligator Reef is a very popular place for boaters, snorkelers, and dive boat operators. Expect a crowd to build up, especially on weekends!! You will find a mostly family-friendly “sandbar” type atmosphere complete with music and folks enjoying themselves. Days gone by – the simple beauty of Ektachrome slide film! Alligator Light from the summer of 1982. Kayaking out to Alligator Light is relatively easy, just realize that it is 4 miles offshore and ALL in open water, with NO place to get out!! Prepare ahead of time by studying the marine forecast and weather patterns. You want to be confident of at least two things .. light winds with calm seas, AND very low forecast probability for lightning storms! This means launching as early as possible from Indian Key fill, right off US1 – there is plenty of free parking. Just make sure you don’t park in any private lots, even if they appear to be empty (like the Papa Joe’s Marina property – DO NOT park there) !! Launch of the Mojito on the bay side from Indian Key fill. Stick close to shore – this is a part of the intracoastal waterway! A Sit-on-Top kayak is a great choice for this trip because reef below the lighthouse is a great place for extended shallow water snorkeling! It should take you about 45 minutes to an hour or so to paddle out. Do not tie off to the lighthouse structure! Instead, bring a small sand anchor and some line to daisy chain several kayaks together if needed. Be sure to anchor in the sand NOT on top of the reef itself! I would actually discourage anyone from paddling out there solo, unless you know exactly what you’re doing and have left a float plan with someone who cares about your well being. The reason being the combination of open water and unpredictable weather – you don’t want to be there all by yourself if something were to happen. It’s more fun to be a part of a small group anyway. Meetup groups like the Miami Kayak Club and others organize group trips from time to time. Paddling out to Alligator Light in the early AM. Remember that this is an 8 to 10 mile round trip – ALL in open water, with NO possibility of getting out anywhere. Plan accordingly and paddle within your limitations and the weather conditions!! Be sure to bring plenty of water to stay hydrated!! MOJITO kayak does the ALLIGATOR! For this trip I chose the “Mojito”, an RTM Disco sit on top kayak. This is probably the nicest handling inexpensive plastic kayak for paddlers under 175 lbs. Granted, it’s a very wet ride, but this is actually a plus in the tropical heat. With the addition of thigh straps, it responds much like a proper sea kayak and is great to learn and practice kayaking and rescue skills. It’s also easy to roll and an excellent surf/play boat for South Florida waters! Flex Kayakfari on the MOJITO! The turquoise water is very clear and there’s lots of fish and coral to observe. In the summer the shallow waters of Alligator Reef are quite warm. You can snorkel for hours if you like, so be sure to bring your mask, fins & snorkel! Please be careful NOT to step on coral heads and DO NOT touch the encrusted RUSTY steel frame of the old lighthouse!! Colorful fish of all shapes and sizes abound on Alligator Reef! Thousands of fish surround the base supports of Alligator Reef Lighthouse. Kayak snorkeling at Alligator Reef! There is great snorkeling all along Alligator Reef! Alligator Light rusting frame detail. 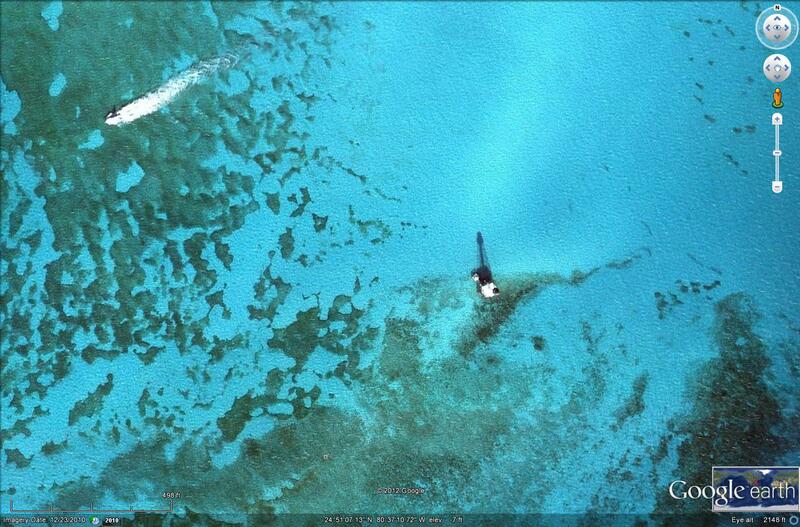 Alligator Reef is very shallow – watch your step! Under the Alligator lighthouse frame support struts. The encrusted and rusty steel frame of Alligator Light. Alligator light seen from underwater! Please remember: DO NOT step on or touch any coral!! Family friendly party atmosphere surrounds the lighthouse! Our kayaks daisy chain anchored off Alligator Light Reef. Fortuitously, on the particular day of our trip, the “doors were open” so to speak and some folks were climbing up on top, so we took advantage and followed suit. I don’t believe this is normally the case, but I was not going to argue with opportunity, and the view from the top is truly spectacular! It felt almost impossible to take in enough of the beautiful blue-green aqua hues of the sky and clear waters below!! Alligator Light tower steps .. slowly rusting since 1873. Closeup of rusty tower steps.. they look like burnt crackers. I bet the lighthouse keeper led a very chill life and must have been in great shape to climb the tower steps all the time! Surely it must have been quite an experience to ride out a storm on it! This lighthouse and the keeper did in fact ride out and survive the infamous Labor Day Hurricane of 1935 which was the strongest hurricane ever to hit the US with winds up to 200 mph. Although the glass and the original fresnel lens were destroyed, the lighthouse itself fared well, a testament to it’s construction and design! Looking straight down from the top of Alligator Lighthouse. Outstanding panoramic view from the top of Alligator Light! 360 spin around aerial view from the top of Alligator Lighthouse. At the top of Alligator Light. I’m looking down at our kayaks 136 feet below! Zoomed in on our colorful kayak flotilla! Being inside the lighthouse, it’s easy to imagine being there back in time, a hundred years ago or more. In order to help preserve the Keys’ lighthouse cultural tradition of nearly 140 years, the Florida Keys Reef Lights Foundation along with local artist resident Larry Herlth “Lighthouse Larry” have been pressing for the town of Islamorada to set up a lighthouse museum park with a series of 20 foot tall replicas he plans to build of all six lighthouses! Larry is also the originator of the annual Open Water Swim for Alligator Lighthouse event, which now draws hundreds of eager swimmers sometimes including Olympic class talent. Larry was incidentally the first person to brave and complete the nine mile open water swim! Beautifully ornate 19th century design of Alligator Lighthouse. As of the summer of 2014, sadly the light is out and the Coast Guard will no longer be maintaining it. By July of 2015 the beacon was removed entirely and the lighthouse is now out of commission. Functionally it will be replaced, but not duplicated by a much shorter and simpler navigation beacon to be built nearby. Hopefully it will be acquired by an entity able to restore and maintain it for the public and a new chapter will open for Alligator Light. It would really be a shame to see it go! Beacon apparatus imported from New Zealand! Removed in the summer of 2015. Up until 2015, this modern setup was solar powered and ran off a bank of batteries. Modern navigation beacon on Alligator Light circa 2012. Since removed, summer of 2015. Alligator Reef Light classic fresnel lens, summer of 1982! I hope you’ve enjoyed these fine views from the top! Gorgeous aquamarine views of surrounding Alligator Reef and clear waters. Alligator Light was automated and solar powered right up until 2015! Standing on nearly 140 years old steel decking on the top of Alligator Lighthouse. Miami paddler and adventurer Leah demonstrates the “Balance Brace” in the shallows off Indian Key. On your return back to land, you can stop by and check out historic Indian Key which is right there along the route! 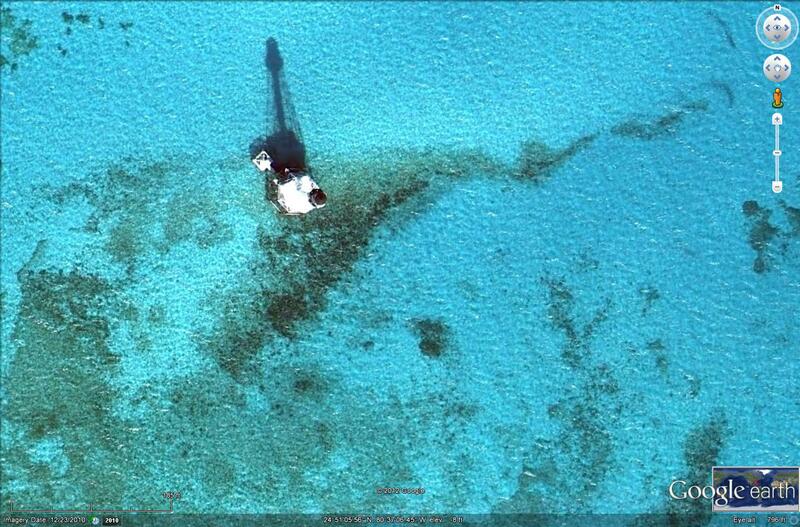 A paddler makes landing on nearby Indian Key. Satellite view: It’s a direct straight shot there & back in a kayak! 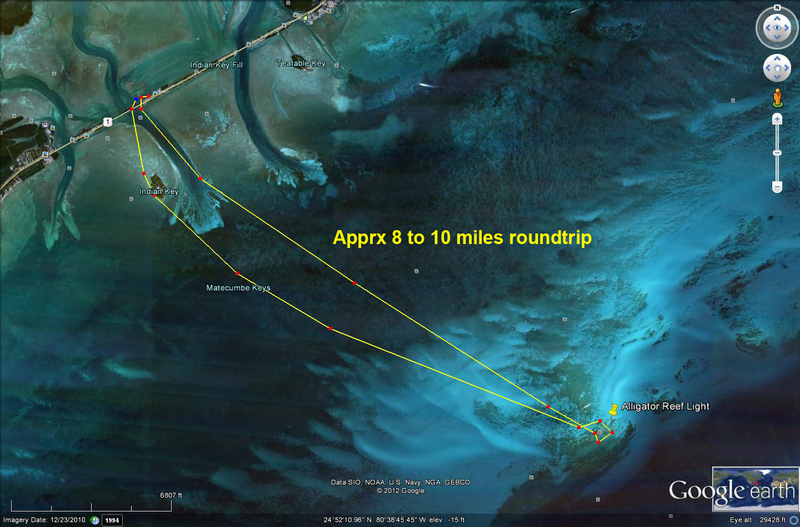 Proximity of other Keys to Alligator Reef Light. 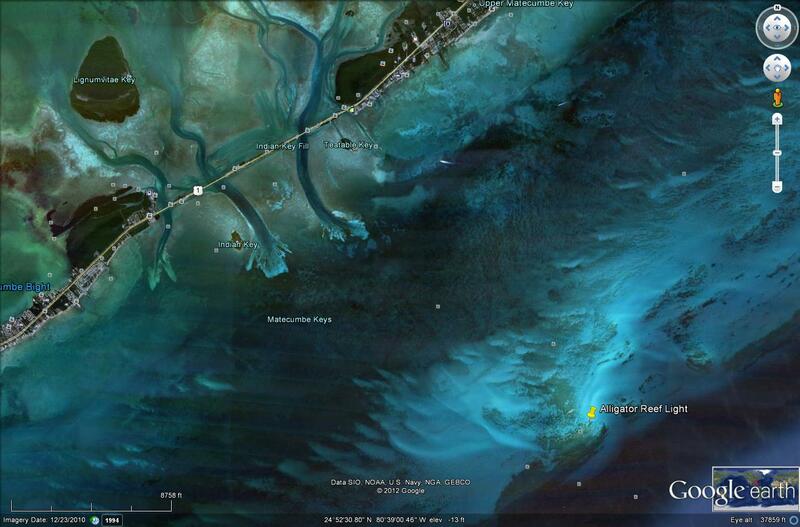 Satellite view of section of Alligator Reef. Satellite view of Alligator Light. Thanks. I’m going to swim out and back later in September. Your info gives me more confidence. Thanks Karl. I’ll see you there .. look for the “Mojito” kayak! !